Using both classical organic chemistry and modern bacterial expression systems we synthesize polypeptides, foldamers and proteins of various size and biological significance. Structure elucidation and internal dynamics of biomolecules are completed by X-ray and bioNMR spectroscopy, as well as molecular modeling, applied quantum chemistry and bioinformatics. 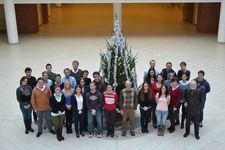 We do cooperate with both Hungarian and foreign research teams on subjects ranging from organic chemistry to molecular biology. 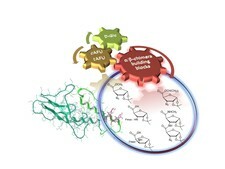 Recently we are synthesizing amino acids derived form carbohydrates, determining conformational properties of beta amino acids, synthesizing foldamers, expressing Exenatide-4 analogs used to treat type II Diabetes Mellitus, and conducting research for a better understanding Alzheimer’s and other conformational diseases, etc…Devoted students and people interested in modern structural chemistry and biology are always welcome. Pyranuronic β-sugar amino acids (β-SAAs) are biocompatible and tuneable building blocks of foldamers and α/β chimera peptides. The scalable and economical total synthesis of two building blocks was described. These C-4 epimers, Fmoc-GlcAPU(Me)-OH and Fmoc-GalAPU(Me)-OH, which are suitable for solid phase peptide synthesis, were prepared via a common oxime intermediate. The new synthesis uses nine consecutive steps, starting from methyl α-D-glucopyranoside. The synthesis is fine-tuned, optimized, and ready for largescale and cost-efficient production. „C-3 epimers of sugar amino acids as foldameric building blocks: improved synthesis, useful derivatives, coupling strategies”. Yield optimized, scalable and environment-friendly protocols for making β-sugar amino acids and their derivatives to built up α/β-chimera peptides.